Among the fixed weight dumbbells, the hex ones are some of the most popular as they come with a series of advantages. For example, their weight heads typically have a smaller diameter, and for exercises such as push-ups, they offer superior stability. Body Solid offers several hex dumbbell sets. And one of the best packages for beginners is the GDR44-RFWS rack, with the 5-30 lbs dumbbell set. The dumbbell set supplied with the GDR44-RDWS rack includes 6 pairs of dumbbells, with the following weights (per dumbbell): 5, 10, 15, 20, 25, 30 lbs (2.26, 4.5, 6.8, 9, 11.3, 13.6 kg). This being said, you’ll have weight increments of 5 lbs, and a total weight of 210 lbs (95.25 kg). Also, since the set goes only up to 30 lbs, this is pretty much a set for beginners and intermediate users. The dumbbells of this set feature the same construction such as the ones of the SDRS550 set. They’re hex dumbbells, with their weight heads coated in rubber. This rubber coating is quite durable, and in case you’re wondering, it comes with two main advantages itself. First of all, it offers a little bit of cushioning for each dumbbell, thus in case you drop them or use them against the floor, they won’t scratch or nick that particular surface. Second of all, in case you’re doing push-ups using dumbbells, they won’t drift on the floor, offering a superior grip and stability. The weight heads feature an extremely secure connection system to the handles. They won’t rattle or wobble when used, as some of the classic adjustable dumbbells might. They have steel inserts, they’re pinned, press-fitted and welded, which means the weight heads can’t possible fall from their axles. These hex dumbbells feature arched handles, knurled and with a chrome finish. They offer quite a comfortable grip. The knurling is not sharp at all, the handles not being abrasive to the hands. The chrome finish is quite durable, and offers the handles the required corrosion protection. 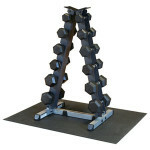 The GDR44-RFWS dumbbell rack is a two-tier vertical type, designed to hold 6 pairs of dumbbells. It features a heavy-gauge steel construction, tough enough to support dumbbells up to 35 lbs each. Its bases integrate rubberized stabilizers, which not only increase its stability, they also protect your floor from damage. However, a mat is also supplied with the set. The rack has a rather small footprint. It takes 27″ x 17″ (68.5 x 43.1 cm), of floor space, and should fit with no problem even into a smaller room. The pyramid design offers the possibility to keep your weights well-organized, and promotes an easy access to each pair. 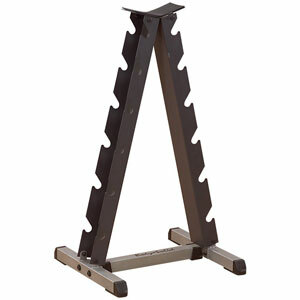 The rack features six main parts, and it’s quite easy to assemble. Assembly shouldn’t take more than 15 min. The tools for this task as well as a manual, are supplied. The bonus accessory offered with this dumbbell set and rack, is the RF34B treadmat. This mat is made of durable PVC material. It’s 48″ (122 cm) long, 36″ (91.4 cm) wide, and 1/8″ (30 mm) thick, offering all the protection your floors can get. It’s also wide enough to give you the possibility to place your dumbbells on it and not on the floor. Evidently, you can use it for exercises as well, if you want. The coating on the weight heads has a faint rubber odor which may be a inconvenience for some users. Considering that the whole set includes a dumbbell rack, 6 pairs of hex dumbbells with a total weight of 210 lbs, and a mat, it offers an excellent value for the price. It’s a set great for beginners and intermediate users. It takes little space and can fit with no problem in just about any room. Just as any other hex dumbbell set, it offers the advantage of quick weight increments selection, without changing any weight plates. 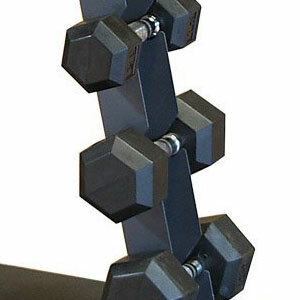 And finally, the dumbbells have an extremely sturdy construction; you don’t have to worry about breaking them.